Typically, the weather is windy, punctuated with short episodes of rain, so tarps and rain gear are recommended to be kept handy. If you don't wish to camp, just come for the Sunday fun & games. We often have 40 -60 people on Sunday! Bring a dish for the potlock lunch, and any items you would like to contribute as a prize. (If you'd like to contribute early, call Joe or Gary for pickup). If you wish, bring a hat for the Easter Bonnet Contest. Being a State Park, alcohol is officially banned, so if you do bring any, please be very discrete. The club gets permits for Friday and Saturday nights, but most people only camp on Sat. night. The Park gates are locked between 8:00 PM and 7:00 AM, so you have to be inside before they close. Campground 'A' is all the way at the back of the park - turn right at the circle, and go down the unpaved road about half a mile. 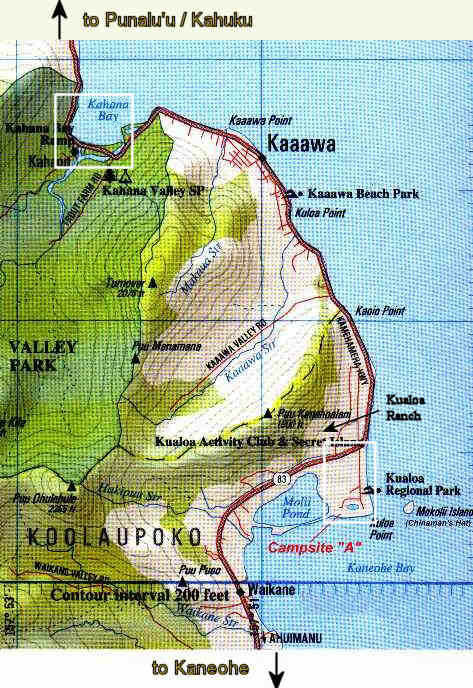 The Large Group Campsite is on the left (north) end, between the Kitchen & Lanai Building and the ocean. See map below, click on squares for aerial photos and more maps. Click on map for aerial photos and detail maps.